Stars: voices of Ty Burrell, Max Charles, Ariel Winter, Zach Callison, Stanley Tucci, Alison Janney, Stephen Tobolowsky, Dennis Haysbert, Mel Brooks, Lake Bell, Patrick Warburton. The animated adventures of the talking time travelling dog Mr Peabody and his adopted seven year old human son Sherman began life as a short cartoon segment in the Rocky And Bullwinkle Show, created by Jay Ward in the 60s. In the shorts, the duo travelled through time to visit some key moments in history and meet some influential historical figures. Like an animated Bill And Ted’s Excellent Adventure, it poked fun at some of these moments, and the concept cleverly mixed humour and history lesson. So there were some concerns when it was announced that this short cartoon was about to be given the feature film treatment. But any fears that stretching the thin material out over 90 minutes are quickly dispelled with this clever, inventive and witty film that will appeal to audiences of all ages. Thankfully the producers have eschewed any thought of turning the material into a live action film, avoiding potential disasters like The Adventures Of Rocky And Bullwinkle (not one of Robert De Niro’s finest moments), The Flintstones, George Of The Jungle, and Dudley Do-Right. These films trampled all over some of our fond childhood memories. Thankfully though, this contemporary version of Mr Peabody And Sherman remains faithful to the spirit of the source material. Mr Peabody (voiced here by Modern Family‘s Ty Burrell) is a canine genius who holds several valuable patents, a multi-millionaire, former Olympic rowing champion, and the adopted father of seven year old Sherman (voiced by Max Charles, from Family Guy, The Amazing Spiderman, etc), a precocious and nerdy child with oversized glasses. 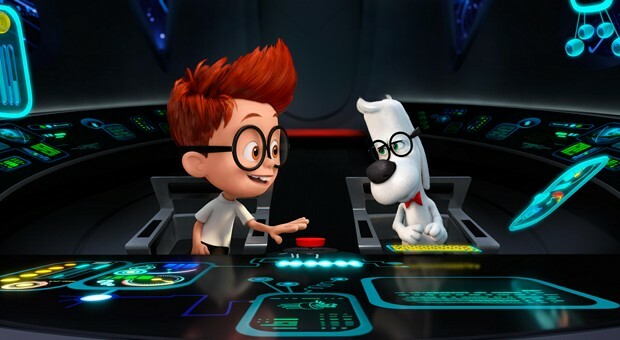 With the use of the WABAC time travelling machine that he invented, Mr Peabody has been able to take Sherman to experience some of the key moments of history and giving him first hand knowledge of some of the most famous and influential figures from the past. But on the first day of school, Sherman’s knowledge of history sees him run afoul of Penny (voiced by Modern Family‘s Ariel Winter), the facetious and bitchy know-it-all. A fight ensues, and Child Protection Services threatens to step in and remove Sherman from Mr Peabody’s care. After all, what does a dog know about raising a human child? To try and ease the tension, Mr Peabody invites Penny’s parents over for dinner in the hope of impressing them and getting them to change their attitude. Things quickly go awry though when Penny learns of the WABAC machine and insists that Sherman shows her how it works. The pair are instantly whisked back to ancient Egypt where Penny finds herself betrothed to the boy King Tutenkahmen (Zach Callison). Sherman enlists Mr Peabody’s help to try and rescue her, and thus begins an adventure through time that takes our heroes from ancient Egypt to ancient Greece at the time of the Trojan War and on to Renaissance Florence. But the film cannot resist working in the usual paradigm of time travel, familiar to audiences from Back To The Future and its ilk, as our heroes break the rules and upset the space time continuum. The present day is threatened by lots of historical figures running amok as well as a black hole that is about to engulf the city. Unlike the original series which featured basic hand drawn animation, this contemporary take features state of the art computer generated animation and 3D that is used to good effect. The director is Rob Minkoff, who gave us The Lion King, etc, and he keeps things moving along at a fast pace. The film is full of clever, groan inducing puns, throwaway lines, and sight gags at the expense of some historical figures. Some of the in-jokes and references may go over the head of younger audiences. But the film’s exploration of important themes like bullying, trust and loyalty, the responsibilities of being a parent, and complex father/son relationships will also resonate strongly with older audiences. Minkoff has assembled a strong vocal cast to bring the characters to life. Alison Janney (from The West Wing, etc) voices the officious, overbearing and humourless dog-hating Mrs Grunion, the Child Protection Services officer; Stephen Tobolowsky as the school principal; Denis Haysbert voices the judge; while Leslie Mann and Stephen Colbert provide the voices of Penny’s uptight parents. We also get a number of cameos from Albert Einstein (voiced by Mel Brooks), George Washington, Abraham Lincoln; an uptight Leonardo Da Vinci (the usually sarcastic Stanley Tucci) who is trying to convince his model (Lake Bell) to crack that famous enigmatic smile; and macho Greek warrior Agamemnon (Patrick Warburton). With Mr Peabody And Sherman, director Minkoff and the Dreamworks animation team have got the formula and the balance right. The film will please those who remember the original series, and delight new comers to the characters.